SATHA has arranged 2nd meeting of Pakistan Policy Research Institutes Network - PPIN. This policy advocacy exercise by SATHA was jointly initiated by Pakistan Institute of Development Economics (PIDE) and Riphah Institute of Public Policy (RIPP) Islamabad. The meeting was held on May 19, 2017 at 10 am to 2 pm in PIDE, Islamabad. SATHA has taken initiative of Policy Research on Marble and Gemstone in its 2nd meeting of Pakistan Policy Institutes Network - PPIN. SATHA has also initiated next working of PPIN on Funding for Policy Research and Database Access. Session on Trust Building Measures between Academia, R&D Institutions, Industry and Society was held on April 26, 2017 in Pharmacy Deptt. University of Balochistan, Quetta at 11am-03pm. The meeting was jointly organized By: South Asia Triple Helix Association (SATHA) and Balochistan University of Information Technology, Engineering and Management Sciences (BUITEMS). SATHA Innovation Award & Networking Dinner, Balochistan was held on April 25, 2017 in Quetta Club, University of Balochistan at 07pm-09pm as part of 2th Invention to Innovation Summit Balochistan, April 25-26, 2017 in University of Balochistan. SATHA gave innovation awards to those heroes of Balochistan who contributed significantly towards society. The winners were from industry, academia and social sector. Meeting on Strengthening ORICs for Trust Building between Industry and Institutions was held on March 9, 2017 in University of the Punjab, Lahore at 11am-03pm. Directors ORICs of Universities of Lahore participated in the meeting and discussed on trust building initiatives that need to be taken. Participants from Industry also participated and shared the gaps in trust building. The meeting was jointly organized By: South Asia Triple Helix Association (SATHA) and ORIC PU. SATHA Innovation Award & Networking Dinner, Lahore was held on March 8, 2017 in University of Management and Technology Lahore at 06pm-09pm as part of 6th Invention to Innovation Summit, March 8-9, 2017 in University of the Punjab, Lahore. SATHA gave around 30 innovation awards to those heroes who contributed significantly towards society. The winners were from industry, academia and social sector. SATHA Innovation Award & Networking Dinner, Peshawar was held on November 16. 2016 in IM Sciences at 06pm-09pm as part of 2nd Invention to Innovation Summit, November 16-17, 2016 in UET Peshawar. SATHA gave 30 innovation awards to the contribution in society, industry and academia. Participants from industry, academia and government also joined the networking dinner. SATHA Innovation Award & Networking Dinner, Karachi was held on December 06, 2016 in Karachi University at 06pm-09pm as part of 1st Invention to Innovation Summit, Sindh, December 06-07, 2016 in University of Karachi. South Asia Triple Helix Association gave innovation awards and provided a platform to bring academia, industry and government together. Meeting on Strengthening KP ORICs with KP ORIC Forum was held on November 16, 2016 in UET Peshawar at 03pm-05pm. Directors ORICs of Universities of KP participated in the meeting and discussed the gaps raised by the participants in university industry linkages. 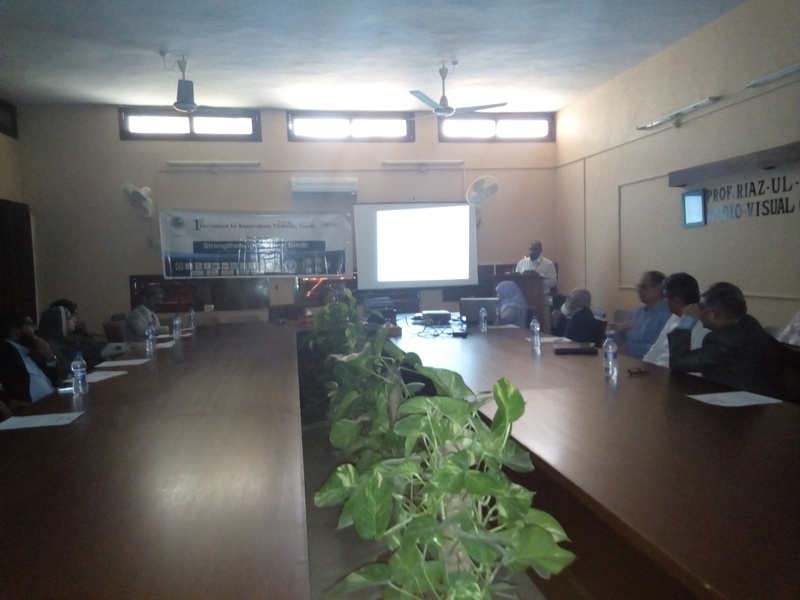 The meeting was jointly organized By: Soth Asia Triple Helix Association (SATHA) and UET Peshawar. 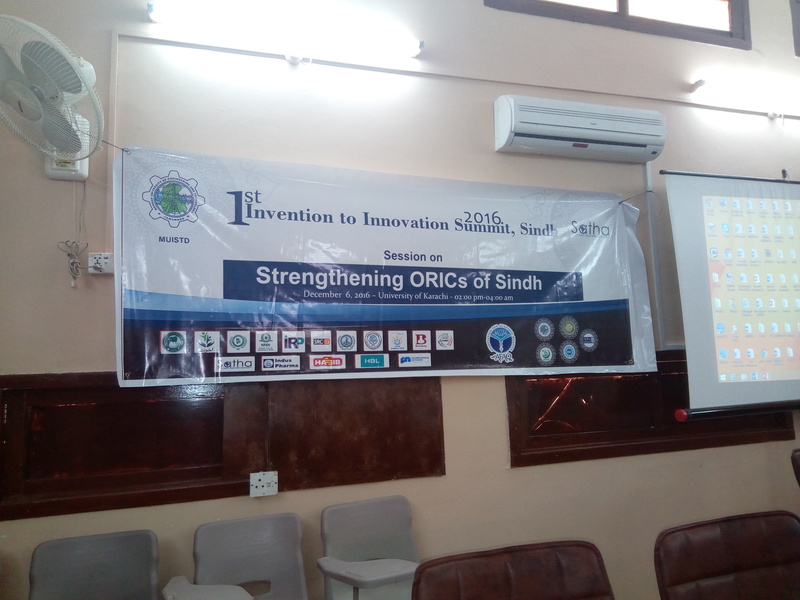 Meeting on Strengthening ORICs of Sindh and Establishment of ORIC forum Sindh was held on December 06, 2016 in Riaz Ul Islam Auditorium, Arts Building at 02pm-04pm. 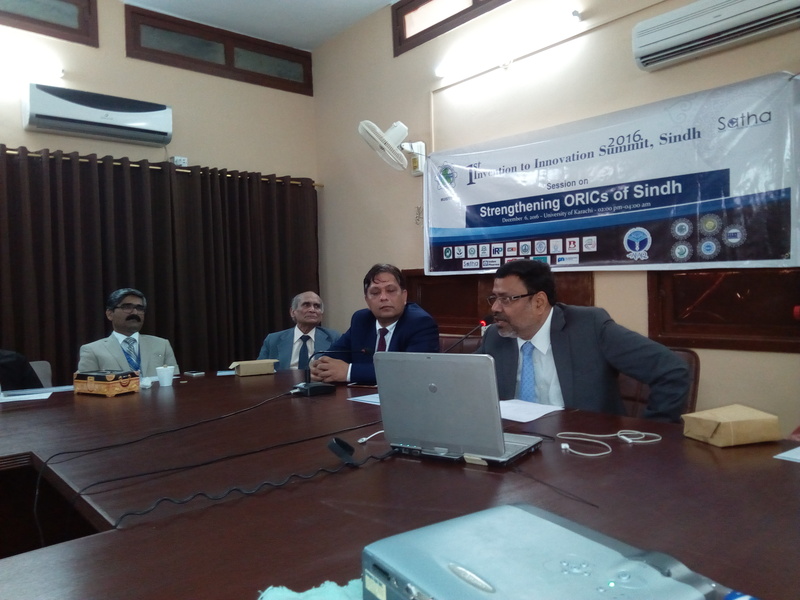 Directors ORICs of Universities of Sindh participated in the meeting and jointly discussed the need of establishing ORIC forum Sindh to make ORIC network sharpen in establishing university industry linkages. 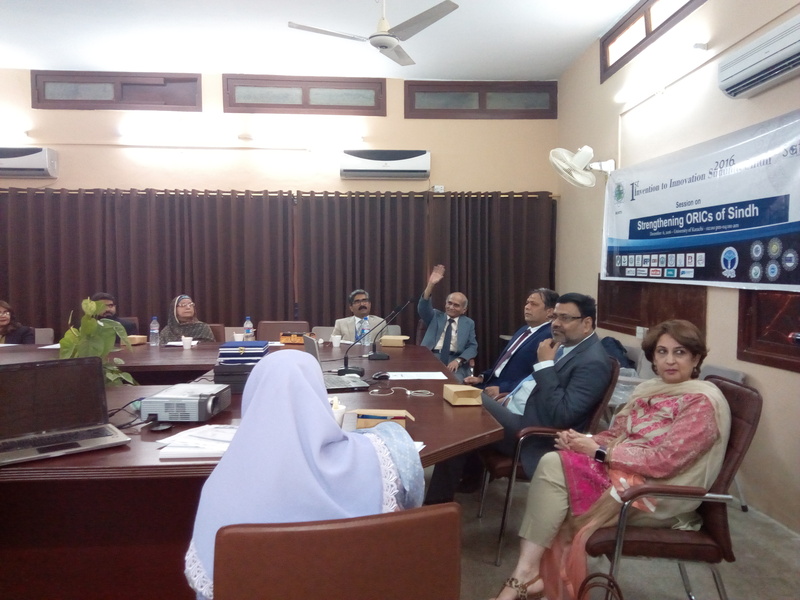 The meeting was jointly organized By: Soth Asia Triple Helix Association (SATHA) and Mehran University Institute of Science, Technology and Development (MUISTD). 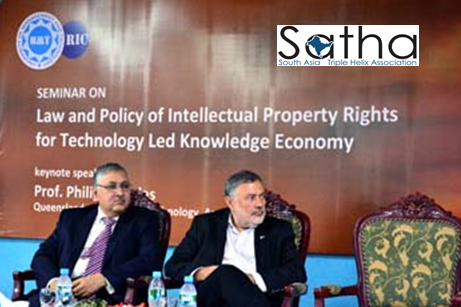 Seminar on Law and Policy of Intellectual Property Rights (IPR) for Technology Led Knowledge Economy, Its enforcement in Pakistan and role of Judiciary in enforcing Intellectual Property Rights (IPR) was held on August 12, 2016 in Main Conference Hall, University and MAnagement and Technology Lahore at 10 am to 12 pm. The agenda is to inspire people for believing in IPR and technology transfer as model of knowledge economy. One speaker spoke on Role of Judiciary in developing strong IPR regime in Pakistan. The other keynote speaker was Philip Mendes who is an Adjunct Professor at the Queensland University of Technology in Australia, where he teaches management and commercialization of intellectual property. Mr. Philip spoke on "Intellectual Property Rights (IPR), Tech Transfer and Entrepreneurial Millionaire Scientist”.